What is Kappa Omicron Nu Honor Society? How do I know KON is a legitimate Honor Society? Kappa Omicron Nu is a member of the Association of College of Honor Societies (ACHS). 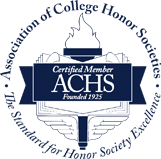 ACHS is the nation’s only certifying agency for college and university honor societies. The Association sets standards for organizational excellence and scholastic eligibility, ensures that member societies are structured to advance the interests of their individual members and adhere to sound business practices, and serves as a resource to protect consumers from disreputable organizations that do not live up to the name “honor society.” Since its founding in 1925, ACHS has represented and promoted the interests of more than 92 million honors students. The Human Sciences are those fields committed to improving social justice and developing more desirable relations in communities, organizations, and the wider society for the benefit of all. Our fields include (but are not limited to) athletic training, design, education, exercise science, family and consumer sciences, financial planning, food science and human nutrition, gerontology, health sciences, hotel/restaurant management, human development, interior design and human environment, kinesiology, leadership, merchandising management, policy analysis and management, social work, textiles and apparel, and wellness. Why should I join Kappa Omicron Nu? What is the mission of KON? Details regarding membership eligibility can be found here. Students who are eligible for membership are invited to join Kappa Omicron Nu by existing KON chapters. See the existing chapter list here. Guidelines for the establishment of a new chapter may be found here. How can I contact KON?